What Happened To Spyro: Reignited Trilogy Coming To The Switch? "We do not have any other platforms to announce at this time." Readers with good memories may recall that Spyro: Reignited Trilogy looked like a dead cert for the Nintendo Switch earlier this year; not only was there the appearance of a Switch listing on the game's official site, but Nintendo itself even carried a listing for Spyro the Dragon Remastered. The charming compilation lands on the PlayStation 4 and Xbox One tomorrow, so we checked in with the lovely folks over at Activision to see if they could shed some light on why the Switch version has seemingly gone AWOL. We're excited that even more Spyro fans will have the opportunity to experience the franchise on PS4 and XB1 platforms. We do not have any other platforms to announce at this time. While this statement doesn't say that a Switch version is coming in the immediate future, it hasn't be ruled out for good, either. As Activision found success with Crash Bandicoot N. Sane Trilogy on the Switch, we can only imagine it will be a matter of time. Let's hope that 2019 is the year for Spyro on the Switch; let us know if you'd like to play this collection on your Nintendo console by posting a comment below. They'd need some Doom level compression to fit the 65GBs down to a 16GB cartridge if it is coming. It should and probably will be here sometime in 2019. Crash remastered came almost a year after the other versions so I expect it sooner or later. A bit of a nothing statement. I'm not really too fussed either way. Liked the games as a child but don't have any overwhelming desire to go back to them now as an adult. At this time..... So surely it means eventually switch. Aaaaand once again we sit back and play the hope, wait and see game. Gets boring after a few years. It risk to require a huge graphical downgrade to enter the Switch, unfortunately, as multiplatform games are rarely optimised. @Orpheus79V Given that the second and third games need to be downloaded on PS4 and X1 (only the first game is on disc) I would assume an eventual Switch version will not be on the receiving end of DOOM level compression. @Kamalen Crash made the transfer alright. Spyro would be roughly the same. I believe they are just trying to hide the "surprise announcement" for later. This is a performance issue. That's why they don't release Spyro at the same time. The game runs at 60 frames per second 1080p on PS4 and Xbox and they don't want us to see the direct comparison. They're going to do what happend with Dark Souls Remastered already, moving the Switch version further away to make it easier to sell. This is a problem now but it would become a huge problem when PS5 and Xbox Scarlett will be there. Will be out next year. No doubt. Ah, the latest forecast point when Switch will fail. Yes, If ps5 comes out you can forget about big titles on switch. Only indie games (and some Nintendo games) will remain. @Megadeth I'm not so sure about that but it would also be completely fine by me. Indie games are where it's at. Translates to "Please buy this game on the Xbox One and PS4 and be pleasantly surprised when we later reveal it is coming to your desired platform of choice so you can double dip and give us even more money." Optimize it than release !!! Until they release this on the Switch I keep playing the PS1 trilogy on my Vita (PS1 trilogy is now on sale too in EU, works on Vita and PS3). Let's just hope that if they release the new one on the Switch the port is better than Crash was. My bet: it will be announced in the January Direct, and released by summer. I recently bought the trilogy on PS3 Store but was holding out for eventual Switch remaster. I can’t see why not but it’s just a matter of when. @Rayquaza2510 what was wrong with Crash? I played it and enjoyed it. If the issue was purely graphical it’s likely I missed it but I didn’t have issues with gameplay. @Megadeth You are trolling, right?? Switch will have sold around 60 million by the time the next gen arrives. Do you think third parties will want to skip such big amount of potencial consumers for a new console with no installed base?? No way! Hard pass on PS4 and Xbox version. As there is no reason this can’t come to switch. If it comes to switch I’ll buy. PS- people still claiming graphics is holding back the switch? lol. @the_beaver it’s been the same for years people claiming a console is dead or developers will pass. If people own the console in big numbers developers will still release. It will probably come out in June like Crash. With half of the other two games getting chopped out, I too wouldn't want this on Switch anyways. Of course this could be just Nintendo telling Activision to hold their tongue regarding the game as they may have save any announcement of that game for a future Nintendo Direct which I was told may either happen before Christmas or after the New Year. @the_beaver most third party games don't come to the Switch now, the install base has nothing to do with it. The Switch is simply too far behind what most AAA developers are creating right now. I like my Switch but you have to have realistic expectations, even the standard Xbox One is starting to be left behind in performance terms in many of the biggest games. Spyro is my childhood, I don't know how many times I wished they remade it. And that dream came true...except I don't have the right console to play it. I'm pretty sure it will come out for Switch eventually though. Didn't Sony and Microsoft strike some sort of deal that makes Spyro exclusive to their platforms for a year or so? That's a good point. They'll avoid direct graphics comparison now to sell the Switch version easier later. Plus they'll probably need to optimize it further to run properly on a weaker hardware. I can wait for the Switch version and see what's the fuss all about this game. I've played the first Crash back then so I bought the trilogy but I've never played Spyro. I mean didn’t PS4 make you download the 2nd and 3rd game anyways? Gotta save 3 cents on a smaller blue ray. Probably won’t compress ****(except for the first game on cart) and just make us download 50GB or whatever. @carlos82 I'm not talking about AAA games like Red Dead 2. I'm talking about stuff like Spyro, Crash, Doom, Wolfestein, Diablo 3, DBFighterZ, Valkirya Chronicles 4, Octopath Traveler, Civilization IV, Ys VIII, Yokai Watch 4, Skyrim, Dark Souls, Daemon X Machina, Warframe, Ushiro, SMT V, etc. Even games like MH World, Kingdom Hearts 3 or Resident Evil 2 could make it to Switch perfectly well, it's just a matter of doing some sacrifices. It’ll be out by next Chtistmas. Everybody settle. @the_beaver No he is not trolling. Production cost does not justify making a Switch port when they have to turn a 4k game to a 720p game with choppy framerate which bring more criticism thatn praise. Even now you are not getting most of the AAA tittles like Fallout, RDR2 etc. System specs is very important for AAA developers. They even skipped 100 million install base of Wii. I’ve said it before and I will say it again: Just as Crash was a timed PS4 exclusive, most likely Spyro is just a timed exclusive for pure home consoles only. Spyro for Switch will likely come out next year along with the PC version. Definitely would play on Switch. My impression has long been that the PS1 Spyro games were better than the Crash trilogy. (I bought the Crash trilogy on Switch and sold it within a week.) I wouldn't mind seeing this collection come to Switch. I will definitely buy this if it comes to Switch. Maybe, just maybe, Activision realised what a stupid move it would be to release a game on the Switch the same week as a Pokemon game? The problem is that Nintendo has stated that they are not really in competition with the other two console Giants. Be realistic, when games will be made 4K native, no developer would like to rework a game to make it fit 720p. I'm gonna buy it on PS4 because it's the perfect timing. Christmas to play Spyro with my family, man this is lit. On XB1 and PS4 Spyro is a top platformer. If it was on the Switch... let’s just say I’m not that fussed. @derickw69 Crash came a year later than the PS4 version only, and at the same time as the PC and Xbox One. Crash definitely had an exclusivity deal, Spyro doesnt, though it's not coming to PC, which is weird. Well, in the other platforms is something as sloppy as the first game on disc and the other two as downloadable, so I can only imagine on Switch wouldn't be very different. Even worse. A game people got over excited about even though it was never announced? A game that went through weird development that made 2/3 of the game a download, and the whole game is enormous for no apparent reason? I think to a degree companies test the waters with reactions on other, cheaper to develop platforms, and then if the game sells well enough, brings it to Switch. Plus since nobody does Switch in-house and has to outsource to Panic Button or a few others, I imagine it takes a lot longer to get the game out as those companies work through their backlog of work. @Axlroselm I mean he is basically. We do get triple a games and while wemag not get all off them we get more than any other Nintendo console has. And imo the games you listed off are no loss at all. I didn't even play them on PS4 or PC. So everyone is different. As much as I'd love to play this trilogy on the switch... I'm not holding my breath for a port in the near future after they announced the file size for PS4 was around 60Gb... I'm pretty sure the switch cartridges are only 32Gb at the moment if I remember rightly? 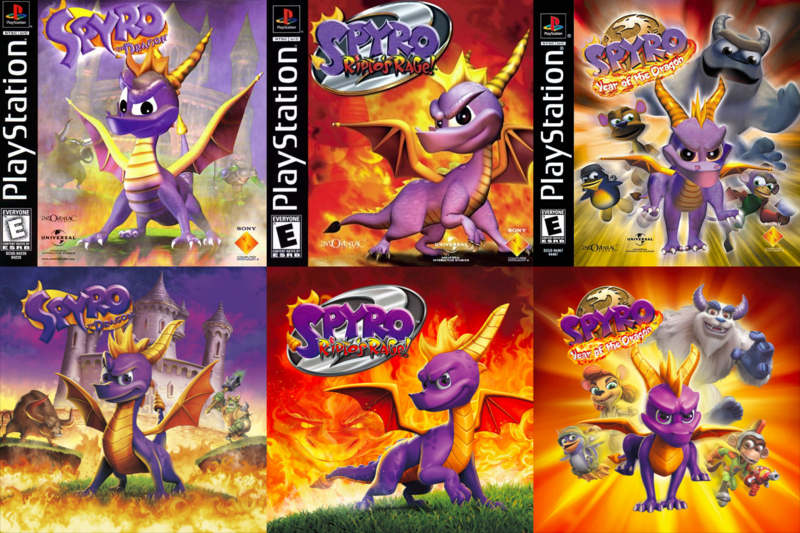 I'm a huge fan of the original spyro trilogy and I have been for practically my whole life. It was a great game for its time and it was really fun to to speedrun once I got into that. From the beginning I've been absolutely positive that Spyro will come to the switch sooner or later. It's a really good console, super versatile and I feel like the game would perform really well on it. But the big questions seem to be when it's coming to the switch, and why it's not coming at the same time as xbox and PlayStation. As for the why question, I think I can shed some light. If you look up Jordan Fringe on Youtube and locate his video about spyro on the switch, he explains everything he was told by toys for bob about why it's not going to be on the switch or PC just yet. In short, they want to make sure they get the games right across all platforms, so they wanted to focus on the two platforms they initially started working on it. Now that the games are out on ps4 and xbox, the switch and pc versions will soon follow. For more details you should check out his video because he does a really good job of explaining it. Personally, I didn't trust toys for bob at first (considering they made the abomination that is Skylanders), but the trailers and all the inside info i got from YT channels covering the game got me super psyched for the remaster. I don't mind waiting a little longer for the game to come out on a platform I own, as long as I know it is eventually coming, which I'm certain it is. The file size is pretty enormous, even by PS4 standards. That's why it's not on Switch. Until someone does some wizardry to compress it down to a quarter of the size. @sketchtuner @NintenDan- Crash was around 30 GB on PC and was 6GB on Switch. Maybe they’re waiting until they can compress PS1 games to under 20 GB each? I don’t care how nice the new graphics look, the original Spyro was 300 MB. Squeeze it on one disc or hire somebody who can. @NEStalgia "even though it was never announced"
As per the article (it even had a link) it was on the official order page AND it was listed on Nintendo's official store. 1 of those may have been inadvertent but I think both of those adds up to announced. And what does "announced" mean anyway? How many games were announced and discussed over and over again for Wii U that never came anyway? Yooka-Laylee, Project Cars, Kerbling Space Simulator. Coming next year for sure. I like and love my favorite Spyro the purple dragon on my Switch. Can't wait to release next year. Are you Spyro Fans. @the_beaver I know what you're getting at but Skyrim and Dark Souls were last gen games whilst the Id tech engine in Doom and Wolfenstein has huge scalability built into it for PC users and even then struggles on Switch. The RE engine doesn't even support the Switch and Resident Evil 2 is looking amazing so I doubt that'll work on Switch and certainly MH World wouldn't, Capcom are well aware of the Switch's capabilities so I'm sure they'd bring their games if they could. Best case scenario for Switch for these is streaming as already seen with Resident Evil VII and Assassin's Creed. Unfortunately the Switch is a bit too far behind in all aspects of its hardware but I suspect that Spyro likely will appear on Switch as remasters of older games are certainly more viable. The shame for us isn't that these games cant/won't be ported, it's that big developers don't try to make games just for the Switch in the first place and use it's unique abilities. Also I wish these big developers would start to make new smaller games like we used to get, rather than just focus on these 60 odd hour slogs that we get today and most get bored before the end anyway. They need time to downgrade it. We should expect that. Switch is already 2 years old. By the time PS4 cames out, it will be 3-4 years old. A couple of years after that, the switch successor will come out most likely. The true matchup will be the Switch successor vs the PS5, just like the matchup is Switch vs PS4 now. And expect a long cross-gen period where releases are on PS4/Xbox One and the next consoles...probably even longer than the last one. Switch 2 vs PS5 will likely make cross-porting even less difficult than PS4 and Switch. That is the trend with mobile hardware getting closer and closer to home console - compare GBC vs N64 and then compare a Switch version of Wolfenstein 2 to Wolfenstein 2 on the PS4. @rjejr Well technically that listing wasn't for Spyro Trilogy: Reignited. It was for Spyro the Dragon Remastered. The original project before they halted, delayed, and decided to make it a trilogy, with 2/3 of it a download. The size is probably the issue here. Not sure that can be reconciled. This game as been leaked too many times for it not to be coming on Switch (and PC). I doubt there will be a Switch version of Spyro: Reignited Trilogy. Activision didn't bother to invest in triple layer Blu-Ray discs, or span out to two or three standard Blu-ray discs. Granted, it is not a standard to use bigger or more discs and it cost more money but the thing is, Activision has money...they are a multi-billion dollar company. Activision can afford to give Toys For Bob the budget to make their game fit on discs. If Activision is not willing fork out the money for full retail copies instead cobbling them together with patches, Activision will most likely not compress the game for the Switch. Sure, they did it with Crash Bandicoot but it was only 23 GB on PS4 before it was compressed to 5 GB for the Switch. Spyro is a whopping 64 GB on PS4 and 42 GB on XBox One. Sure, you could argue Bethesda did compress DOOM onto the Switch which has an average size around 40 GB on other platforms but it all comes down to money and Bethesda was willing to take the risk. If Activision is not willing to invest into producing full retail copies of Spyro: Ignited Trilogy. I doubt they are willing to spend the money to compress such a large game. Perhaps if it was a smaller business publishing Spyro, I would give them a pass but that is not the case. Also, do you really want a crappier version of this game anyways, I sure don't. @MortalKombat2007 Spyro needed Switch Game Cartridge. Up to 128GB of Switch game Cartridge and physical version will be came out next year. Cartridge is the best than Blu-ray. @Axlroselm there is a difference between switch and Wii in that the consumers buy the games (and a lot of them). As the hardware numbers raise I am expecting more and more third party on board. Let's see the next year who's correct. "This is a problem now but it would become a huge problem when PS5 and Xbox Scarlett will be there." Really is that the best that can be said? I doubt you will have the $$ then want you to pay for it at those soaring prices. Consider a 500$ xbox and ask the price will be 600$ in 2019. And where do you think the problem will be then. @carlos82 The only thing going for getting Spyro on Switch instead of stuff like anything made in the RE Engine as you mention, is the engine that Spyro runs on. @Tasuki When the Switch inevitably drops off of a cliff at the announcement of the PS5. Yeah at this time. That means give it six months. I got suckered in to double dipping on crash and a few other games. I can wait. @PCkid "This is a problem now but it would become a huge problem when PS5 and Xbox Scarlett will be there." Don't buy at Launch because may Factory Defective console have an issue same happen last time. We should later to buy in 2 years. Until wait Nintendo Switch 2 will be came out. "What Happened To Spyro: Reignited Trilogy Coming To The Switch?" They... never said it would? "but I suspect that Spyro likely will appear on Switch as remasters of older games are certainly more viable." Implying the only reason Spyro will show up is because it's a remaster, not because of the underlying technology. @NEStalgia "The size is probably the issue here. Not sure that can be reconciled." That's probably part of it. And just actually getting around to doing it, as it took a year for Crash. And from what I've read Crash was 1/4 the size on Switch as PS4 so maybe they can do that again. Sounds like Crash had some other, shall we say, compromises, as well, so Spyro probably needs a lot of work yet as to me Spyro looks better than Crash. Maybe everybody is waiting for "New Switch" next year to release games that can run w/o too much downgrading. A bit disappointing because I prefer Spyro over Crash. @Frendo said "So bad compressed files or what?" Just Really High Definition textures, higher poly count and high quality FXs... All of that, takes place espacially for three games. 200 Gb for one game will be something common. It's sad, though, that a PS2 game gets remastered in such a way that it suddenly can't run easily on a Switch....which is light years ahead of the PS2 hardware the game has been running on for decades.... Talk about bad design. @NEStalgia um, the first 3 Spyro games were on PS1, Insomniac made the Ratchet & Clank series on PS2. The Spyro games were only about 300MB each. @rjejr PS ONE? That's even worse! I was thinking Spyro was a PS2 thing. I never played the first 3, just the second trilogy with Cinder etc. Definitely not the news I expected to come back from work to. "I just want it to end. Aren't you tired?" From this midnight onwards, I'll still be able to play the game: I gave in and bought it on Xbox One. It's not the one console that I want to play Spyro on, but still a console that will allow me to do so. All I want is the rumor mill to just end. A definitive yes or no, so that I can come to terms with either answer. I’m starting to give up with Nintendo. This year has been almost identical to the Wii U, apart from the obvious failure of the console, but game wise it’s the same magical flamingos. Oh we can’t bring this to the switch for this reason, or it’s delayed for that reason. Being a Nintendo fan is tough work. @NEStalgia "the second trilogy with Cinder"
Early Spyro fans don't acknowledge that trilogy. @sketchturner Two things of note here. First, compression on Switch games is insane and second, that huge download probably includes the massive 4k textures, which Switch would not need. Just the 1080p textures would shrink the file size dramatically. Just as well, because we'd be forced to download them all digitally anyway. I already got the game on my PS4 much like I did with Crash. Can't say I really care about it showing up on the Switch, I got Mario Odyssey on that. @KingdomHeartsFan Maybe next time Nintendo will play catch-up and use more than 32GB of system storage. Or not use an expensive storage medium unit that forces developers to charge more for a game because of the price on the cartridges. Wow, that was longer than it needed to be. Its a perfect fit for the Switch. Another physical game compilation where most of it is digital! Just what every wants! I want it physical. But with the news it is still just 1 game on disc for the others, dont see myself buying it anyway. Charge retail price for a digital game is a deal killer. 100% agree. Being a Nintendo fan requires lots of patience. The red headed step child treatment. 2018 has been the worst year as a Nintendo fan. far worse than any Wii U year to me. I think the same and guess what I just discover today ? this Is what happens when you hire overweight and overpaid PS4 fanboys to manage your company. There have been numerous times where publishers say they have "no plans" for the Switch /Switch version but i their game came out anyway. They can compress the Switch version, so I'm not worried about storage. And we have plenty of games to hold us over until then. @Mgene15 Yeah this has been a really weak year overall for Nintendo fans, we got nothing really until the end of the year. At least we will finally have Pokemon and a new Smash soon. @Orpheus79V -or just shell out the moolah for higher GB carts. Everyone knows the game is coming. But they can't say that just yet, obviously. If you'd rather play it on Switch, best to hold on to your cash for now. I plan on getting it on my PS4 (even though I am more of an Xbox and Nintendo fan), because the original trilogy was exclusive to the PS1, but I would love to get it for the Switch if and hopefully when it launches for that system. Heck, I already got Undertale on Steam, and I got that for the Switch, as well. But I just hope that this will usher in a new era of Spyro games that take place within the original continuity, taking place after Shadow Legacy for the DS (the final game in the original continuity), and ignores the continuity of The Legend of Spyro Trilogy (which I did love) and Skylanders (which I have not played and never will). Yaaa, I'm gonna have to call BS on that. Either you weren't actually there for the Wii U (I was, and Wii U owners would have killed to have a lineup like Switch got this year) or you're just intentionally spinning the narrative (which is generous, tbf it's just downright lying). It's one thing to say you personally didn't enjoy this year on Switch. And that's fine. You've got your taste in games and playstyles, and if nothing in that long list of quality titles interested you (for whatever reason, whether you played a game before or you just aren't interested), nobody is going to question you on that. Nor do I think anyone cares. But to state this year was "almost identical to Wii U" is a verifiable falsehood. The fact every single one of those games broke new ground as first ever hybrid version, and for the vast majority, first handheld version period, means the excitement from each and every release has been doubly pronounced. No spyro is not coming to nintendo switch. Lets be realistic. Modern gaming is full of crap. Devs are going to smartphones now!!. Why must it be a port? The gba is weaker compared to ps2, games still came for it. The nds is weaker to the ps3..yet games still came out for it.....the switch is weaker to the ps4........oh crap.... there will be NO games because its weak.....................................Wtf devs???? This will be release today on XBOX ONE and PS4. But Sadly need Switch. If Switch can barely run Crash Bandicoot that has linear 3D worlds and 2D levels I honestly don't know how they are going to make this run on Switch. Probably they still don't know. @Evilworm Well, that's why Switch gets lots of mobile games. Jordan Fringe - This guy I trust the most when it comes to Spyro news. Anything else is just smoke and mirrors. @Mgene15 Not Wii U cuz it had next to nothing but perhaps N64 levels of 3rd party support as of now. Not n64 because switch has next to nothing 1st, or 3rd party support this year.basically Just indies and ports. 1st party ports don’t count in my book as that much “support” either. @Mgene15 So your book then cuz my book is not the same as yours. DId you bought the Switch at launch ? I did and I got Joycon and WiFI issues. Another strange thing that I never heard of, is that my Switch is not straight when docked. This is not a problem to play but it looks so "low quality". It's almost like I see only that when I sit on my couch. You see, Nintendo, Microsoft and Sony I buy their products at launch. There is a two years warranty on each. When I take the time to read your list of games, it appears that you have shown the real problem with the Switch. The majority of the titles are ports or mediocre exclusives such as kirby or Mario Tennis Aces. There is a real lack of new good titles on Switch. Anybody with objective eyes sees that. In what way does it barely run Crash when it has had more ambitious titles running well on it? Spyro has Yooka Laylee-style graphics (cute, but not impressive) and probably not even bigger levels. So why shouldn´t it run on a Switch when Yooka Laylee can, even with a crappy engine? Like JaxonH, I call this one BS-comment. If you bought a WiiU, you would have been sitting on glowing coals every year to get anything usable, but just appetizers over and over again besides some bigger exclusives. The third party-support was horrible from the beginning. Not to speak at the end. Since Playstation 2 I didn´t play that much on a console like on Nintendo Switch. 2018 wasn´t great when it comes to exclusives while there still are some big ones. But the third party-support is the best since Wii and probably has already surpassed the GameCube. It´s second year of the Switch and there are more third-party-games released in 2018 than probably in the whole WiiU generation. You shouldn´t blame Nintendo for lazy publishers. It´s obvious that Activision tries to cheat customers with Spyro. Even on the other systems they tried to cut retail versions by forcing partly digital downloads. Activision is to blame here for there untrustworthy release politics. @Orpheus79V The don't need 4K assets on Switch and 32+GB cartridge will be avaible from January. That's a completely separate argument than "it's as bad as Wii U". And a subjective one. A truly objective person though, would never arbitrarily limit the quality of a lineup based on "only games that fall in this category". And some of the best games on Switch dont need to be "brand new" to make the library amazing. People buying up Diablo 3 in droves dont care if its "brand new" or not. Its brand new on handheld and hybrid, and it's a great game... that's all they care about. The quality of a library is how many great games it offers that people want. As long as people want a game, it doesn't matter how new it is. Besides which, not every game falls into a neat little "new" or "old" category. Civilization VI isn't new on PC but on console the Switch release is an exclusive debut, brand new for console gamers. And DB Fighter Z and Wolfenstein 2 released with a 6-9 month delay. Is that now "technically old" and thus rendered unimportant? No. Games release with delays like that on PC all the time. Nobody cares. They're still considered as new as any other game. So ya, if one wishes to spin narrative, you can "disqualify" a ton of releases on technicalities. Which makes sense in a console war debate, but makes little sense with regard to actual practical appeal. I wonder what percentage of Crash sales was on the Switch. Maybe they simply decided it's not worth the effort to work on the Switch version for at little return. I've always wanted to play these games. We all know Activision is not particularly known for making good decisions. I don’t see it as being an issue. PS4 and XB1 will continue to get lots of multiplats after their successors launch (like PS3/360 got COD, Watch Dogs, Shadows of Mordor, Alien Isolation etc). And let’s be honest, if there’s money to be made the Switch will get ports. And I say that’s as someone who doesn’t care what PS4 ports reach the Switch and doesn’t think it needs them to be Successful. Clearly, Activision doesn't like money. They brought the Crash trilogy to all three console platforms but it was the Switch version that outsold all the rest. This likely would have repeated had they done the same with Spyro, especially considering Spyro has more of a history with Nintendo hardware than Crash Bandicoot did. This project was started before anyone knew how successful the Switch would be. And the graphics pipeline looks to me to have been of the "fast but huge" variety. Reducing file size would require a lot of effort. But ultimately, I think we will see an announcement within the next couple of months. @derickw69 as i remember crash was one year exclusive for ps4 and came on other okatforms at same time. @Discostew Irregular performance and downgraded visuals in, as I have already said (did you read it? ), a linear 3D world with many 2D levels. Don't you see Spyro is more complex and that the remake is also high-quality? Have you seen any videos of the Xbox/PS version? @EasyDaRon The visuals are as demanding as Crash remake and the worlds are not linear or 2D as Crash. Have you watched the remake or just the original games? I am speaking of Yooka Laylee. What does make Spyro more demanding than a game like Yooka Laylee? Yooka Laylee has the same demanding graphics and the same open level structures and still runs on Switch. @BlueOcean Yes, I have seen footage of the other versions, and yet the Switch version has been shown to keep up in performance. Is it downscaled? Of course, but the game still looks good and is VERY playable. Being linear means nothing here. Seriously, the game is based on the original that ran on a PS1. It's a remaster. Much of what was added in is fluff. Fluff that can be trimmed down. Same can be said about Spyro. They're not trying to change the formula. They're trying to present a classic with a modern coat of paint. Seriously, this whole deal about linear design and free-roam is mute when they've been doing these things for generations on far weaker hardware than what we have today. Lol: ign gave it a big score, but the only thing people are talking about is the "2 of the 3 games download only scam", wich the reviewer didn't even mention (shame on him). I guess it will bomb, and if this also happens on the Switch version I won't get it either! It's more graphically advanced than Crash. Probably needs a bit of time to optimise for the platform. @EasyDaRon Spyro and Crash look more impressive to me than Yooka-Laylee but it all depends on how they downgrade the visuals, I should have added that to my comment. You are technically right, Spyro could run on Switch, but if Crash was downgraded so much imagine Spyro, a more open game. @Discostew Yes, they are originally PS games. No, it's not a lick of paint. Crash Bandicoot N.sane Trilogy's gorgeous visuals were vastly downgraded on Switch, imagine Spyro Reignited Trilogy which has more open worlds and the same level of AAA visuals. @BlueOcean Being open world means nothing in this case. As it is, you're trying to argue that Spyro is seeing an improvement over Crash because it's going from linear design to open world, yet why is it that can only be attributed to the PS4/XB1 and not a possible Switch version? Going from linear design to open world is not even a graphical change. It's how the engine handles things, and if the engine used for Spyro is based on the one used for Crash, then that already grants favor towards a Switch version. Fact is, for what was downscaled with Crash on Switch, it still holds up really well. No one is expecting the Switch to handle PS4/XB1 details, but the design of the games allow a bit of trimming and still look good even on weaker hardware. Let's not forget another little fact. Crash wasn't even set for Switch until one developer spent his weekend getting the 1st level running on it, and it ran it well. Switch is more capable than you give it credit. It's just not a PS4/XB1. @Discostew "you're trying to argue that Spyro is seeing an improvement over Crash because it's going from linear design to open world, yet why is it that can only be attributed to the PS4/XB1 and not a possible Switch version?" I am no trying to argue that. YouTube videos don't show the massive level of detail and advanced lighting that the games have. If you could see Crash on Xbox One X you'd understand. The river levels for example. Spyro uses another engine but the visuals are similarly detailed. I'll say one last time yes, technically Switch could run almost any game if you downgrade the visuals and I never said the opposite. The results aren't always great though. Sometimes resolution gets so low that the game is blurry (Wolfenstein II on Switch) and sometimes the game has performance drops (Crash on Switch). There is a video on Digital Foundry analysing the performance. Spyro on Switch would look and perform worse. I am not happy about that, just wondering if the developers would bother and how would it be. @BlueOcean You're bringing up the 4K machines when they aren't even the baseline targets for the games. Of course they'll look superior. Wolfenstein II on Switch got a patch recently on Switch that bumped up performance and visual quality to get pretty close to the XB1 version (but remains at 30fps). You mention DF, and yes, they mention the many different things that got cut back in the Switch port of Crash, but they also said, and I quote "With all those changes, you'd kinda expect the Switch version to look rather poor, but as you've no doubt seen, the results are still pretty good. It's a step down from other versions, but it still kinda holds up. It's a nice looking game." They touched on this earlier by mentioning the game itself is styled like a cartoon, which allows cutbacks and still manages to look good. Spyro is in that same territory. Maybe this is just a personal standards thing where you find the game to be poor whereas others, including DF themselves, think it's still good when all things are considered. You're right about the engine though. They aren't using the same thing. 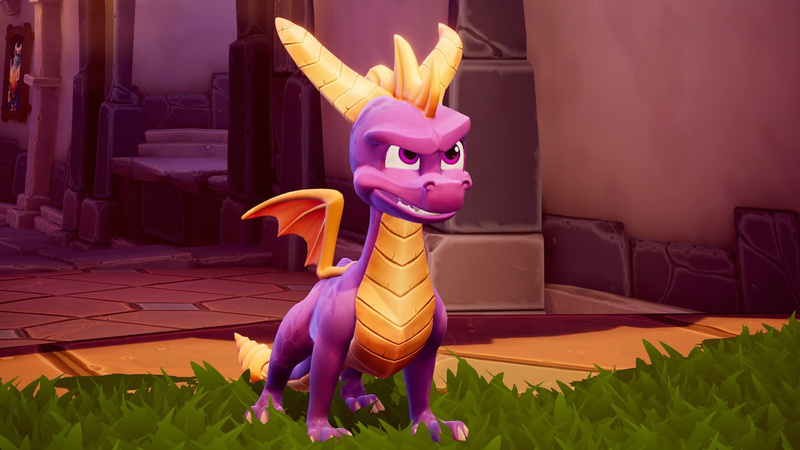 However, the Spyro games are using UE4, which is fully supported on the Switch, and the engine on Switch has seen a LOT of visual and performance improvements. @Xaisu this year alone we've got Dark Souls, Octopath, Kirby, Mario Tennis, Donkey Kong, Mario Party, Captain Toad, Crash Bandicoot, Pokemon, and we're getting Smash in three weeks. With the Wii U we were getting like 1 or 2 big first party games a year, and zero third party. @Xaisu Not to mention all of the games that were announced this year, like Animal Crossing and Luigi's Mansion. I think the only way to solve the size problem is to have the first one on the cartridge and contain downloads or download codes for the second and third one with it, or something like that. @Gridatttack Hey, this may come out of nowhere, but do you have a source for your profile pic? I'd love to see it! @1_21Gigamatts sup. Unfortunately, no. I first saw it in the Amino app, and then reverse image searched to find the source, but I couldn't I only found a higher Res from someone on twitter. Tried searching for a Marie one too, but no luck. It may be that it comes from those japanese image sharing websites. @FragRed You do know that's just a perfectly normal PR response right? Oh wait, it came fron a AAA developer, so they mush be greedy like all of rhem obviously are according to Jim Sterling! @memez Doom pulled it off, you just had to download the multiayer as part of an update Why would they be seperated anyways? @RevampedSpider Because the download size is so huge on PS4 and Xbox One already, I don’t think they’ll be able to crunch it down to fit on a Switch cartridge. Besides, wasn’t that the original plan anyway? @memez I bet if thwy asked Nintendo to do it they could pull it off. It's like they're compression wizards. @RevampedSpider That is true. Maybe they could. But the file size seems a little bit too big for that. I own a nintendo Switch and a Wii U, and the classic original black and green screened gameboy. I'm not a nintendo hater, I just know they use weak hardware, especially when compared to the ps4, and everything has weak hardware compared to the xbox one X. Really I think it's the optimization part most of all. Maybe the Switch could run a VERY HIGHLY optimized version of the game. That's never going to exist. Ever. Actually max Switch game card size is 32gb since launch and 64gb cards should be released some time during 2019. @C-Block Yes, but so far they've been used rarely, Activision using a 16GB card would be more likely even with the larger ones available just based on precedent. Do I give up hope, now? Or should I wait for the next Direct and then give up hope?